Hi there, welcome back! This marks the half-way point in the month and in the album. Is it me, or is it coming really fast, and going even quicker?! I almost feel a slight panic – there is clearly not enough month for this album. I have a process video for you today showing Days 11 thru 13, so take a look and then I’ll show you close-ups for today! I did not change much to this layout. We spent a little time at the park because it was so very pleasant, and I took a few snaps of me and my son. On the left side I added a graphic from Ali Edwards’ December Storytelling class digital files and a simple circle with a quick sentence. That is the extent of this day’s journaling. I also added a file tab just like the previous day, and called this side done. The right side I didn’t change much, just removed the tag and added the little elf with some sequins, and also some of Maggie Holmes’ glitter transparency hearts. I just pretty much love this project. I love how it’s coming together and I love the memories that are being made and documented here. I will tell you yesterday and our entire weekend was a really big struggle, lots of challenges here, but these layouts help me remember the good times. For this I am incredibly thankful. Now go, do, and create today. I’ll see you soon! 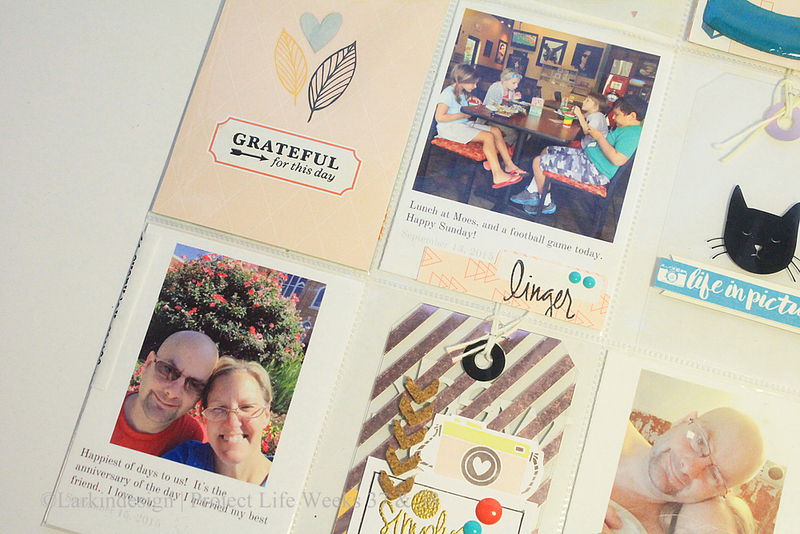 *December Daily is the creative brainchild of scrapbooking genius Ali Edwards, and is a process of documenting December memories by photographing and writing stories each day. To learn more about this project, and find links to shop for products, please visit her website here. The file tab and the little elf are products I ordered from Pretty Little Studio. I highly recommend her products and hope you will visit her lovely shop here. 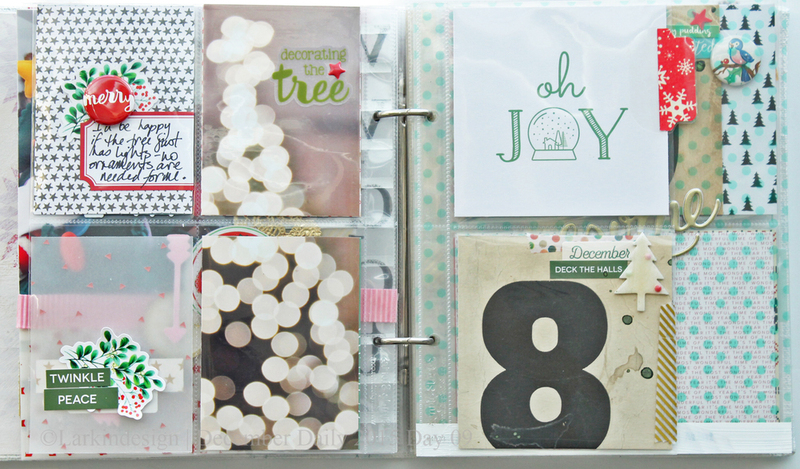 Catch-Up December Daily 2015 Days 8 & 9 (Plus a Video)!!! Hi there, welcome back and grab a cuppa something because this one is going to go fast and filled with yummy inspiration! I have several days to catch up on – the last blog post was photos for Day 7, so yesterday I had to complete Days 8 & 9. That is totally ok, and completely part of the process, to miss a day and pick back up on the following day. Some really wonderful things have been happening around here, and that is most important. So first up, I have a process video that shows all 3 days. I hope you enjoy! And now for the still photos for Days 8 & 9. I’ll just tell you quickly what was going on, and then post photos. For Day 8 we started working on decorating our tree. We mostly just got lights put on. My journaling was really just a quick note about how I’d be happy if we only had lights on the tree. The white tree from Ali Edwards’ Main Kit was coated in Glossy Accents and then I applied the enamel dots while the glue was still drying, so they became part of the tree itself. So cute. Now for Day 9. I realized that photographing this way made it confusing with Day 10 showing through, so I slid a white sheet of paper underneath to help make Day 9 show better. On this day I had the most amazing lunch with my wonderful friend, Katey Zeh. Katey is the founder and director of Healthy Families, Healthy Planets, an organization that advocates for maternal health around the world. Her work can be seen here. Also, to learn more about an upcoming class she is teaching through Drew University, on advocacy work, please click here. Katey has long inspired my own work in women’s issues and my own advocacy, and so to sit at the table and chat with her about motherhood, blogging, healthcare, theology, and women’s rights was truly amazing. I’m still processing our conversations, so I didn’t journal much at all. That’s ok, too, to not tell the whole story quite yet. That story will be told in other ways! Alright, I hope you enjoyed that! I am off to spend another amazing day with my lovely husband, we are attending a Monet-inspired art event and I can hardly wait. I won’t do my usual links, because I am out of time! But, I will credit Ali Edwards with the December Daily concept, and to learn more about this incredible project please visit her website here. Thanks so much for stopping by! Now go, do, and create, and I’ll see you tomorrow! December Daily 2015 Day 5! On Day 5 we had the most fun shopping in downtown Kernersville and checking out the Christmas Around the World that all the shops hosted. I took way too many photos, so it was really hard to choose favorites. I decided to add a flip-up page to house two photos and my journaling. “Tonight was the most magical time, the sorts of evenings that story books write of, right here. The town of Kernersville hosted a Christmas around the World, and all the shops downtown opened their doors wide. Each shop was assigned a country, and they offered samples of food and pretty things to buy. We had such a good time and I’m sure the kids filled their bellies! The best part was seeing all our kiddos laughing and being together. I want all of you, my dear loves, to remember these glorious days when you were all young and filled with life and love. You all love each other so very much and are each other’s greatest gifts. When you all are together and loving on each other, you create your own special brand of magic. It starts and ends with you guys, and will last long after Alan and I are gone. I love you all so dearly, and I am so happy you all have each other. This is magic. This is joy. On the photo on top I simply added the Merry word from Ali Edwards’ kit and two sequins with enamel dots, and a file tab from October Afternoon. On the facing page, which is the back of Day 4, I had a blank square. I decided just to add a wood veneer word and a couple of word stamps. Yes, I totally smeared the red words, and I’m just leaving it as is. That is ok. So that is Day 5, technical issues and all. I still love this project so very much and am so happy that I am keeping up. I hope you are enjoying this journey with me, now go, do and create! Within each post I try my best to post links and attribute the products I have used in today’s layout. Sometimes, sadly, those products are no longer available but still deserve attribution. 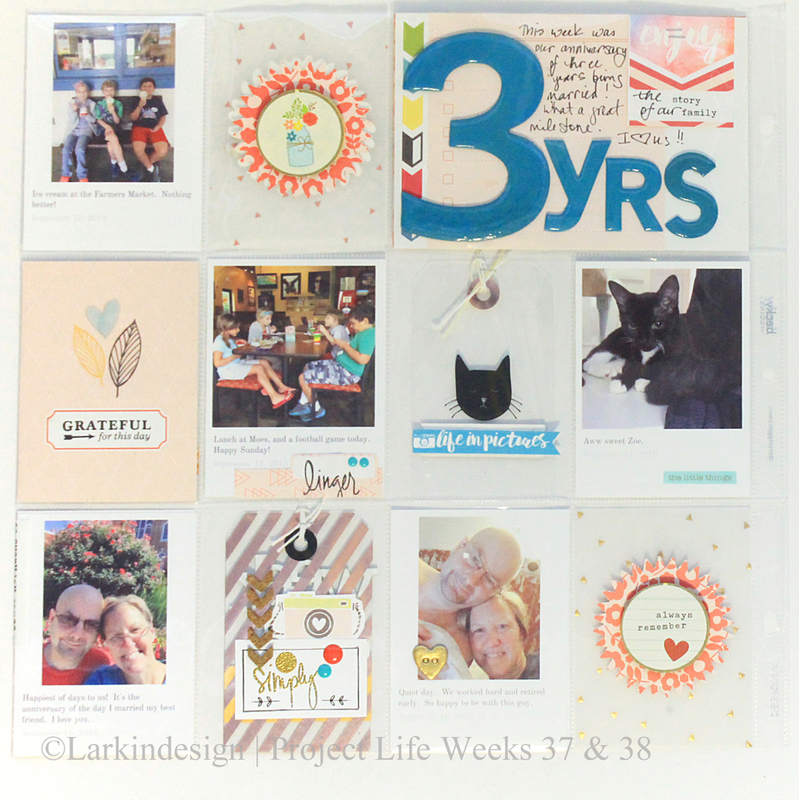 The red banner I used on the journaling card is from an old kit from Gossamer Blue. The wood “Adore” word is Heidi Swapp. Welcome and December Album 2015 Sneak Peek!!!!! Hi there and welcome to our new home right here! I’m so excited to be starting in a fresh place and I hope you enjoy the new look. All my previous posts are still available at blogher.com, and can be found here. Feel free to browse around at my previous December albums and Project Life layouts! Also in the future I will be uploading my December albums from previous years into the gallery here. 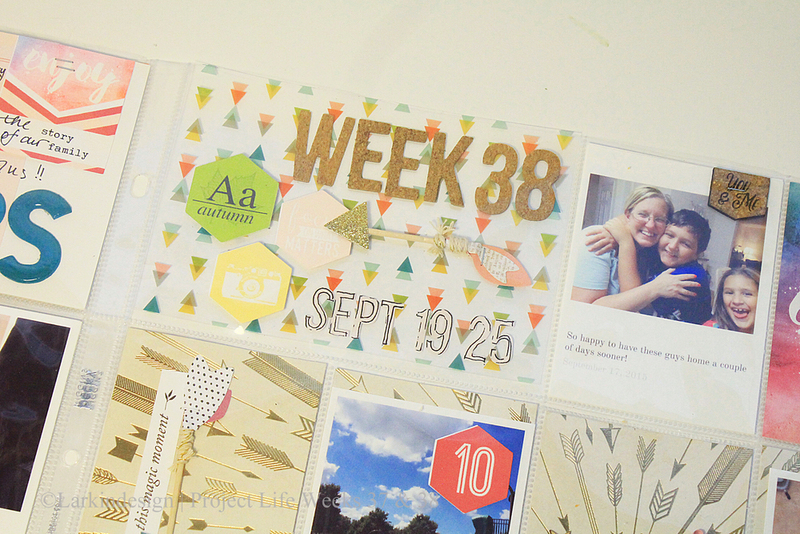 I have been working almost obsessively (ok, really obsessively!) on my foundation pages for December Daily. This is a yearly tradition that I follow to document our December memories, a tradition created and inspired by Ali Edwards. I have been doing this project for about seven years now, and the albums I have created definitely rank as favorites in our house. A big part of this project involves assembling and completing the foundation pages in advance, so that during the month of December you only have to add photos and journaling. This year my album was created using a set of subway numbers I found at a local shop. December Album 2015 Day 20 | Subway numbers have been cut down and made into sequin pockets; pockets are then sealed with washi tape. The size of these subway numbers presented a few challenges in creating this album. Their size was awkward: 5 1/2″ wide by 5″ tall. Certainly not typical scrapbook sizes! I will share more on that journey later, but suffice to say this is actually my second album I’ve created and the first one did not work out (not to worry, it is being re-purposed and will be another project I will post for you soon!). But at any rate, I decided in the end that these numbers could be cut down to fit in ordinary pocket pages and so be it. I’m so happy with how these foundation pages turned out and cannot wait for December to get here already! I completely love the kits and products I have chosen. The album itself is from Simple Stories. I am working on the video that shows how I treated that album to create what you see in these photos! I hope you have enjoyed these sneak peeks into my December album as it is right now. Stay tuned for so much more fun to come – videos, how-to’s, and of course photos that I hope will inspire you to create your own! As always, please feel free to share your own December album in the Comments section. And I hope you will Subscribe via the button below so you can follow along in my creative journey.